The twist at the end of The Empire Strikes Back is easily one of the greatest of all time, if not the greatest. It's hard to imagine a time when it was an actual surprise, but there's little doubt that gasps were heard in audiences around the country in 1980. Too bad that actor David Prowse almost screwed the pooch. The Retroist has uncovered a newspaper article from 1978 in which Prowse, whose claim to fame is being the guy in the Darth Vader suit, revealed that the Dark Lord of the Sith was, in fact, the father of everyone's favorite Tattooine farm-boy. 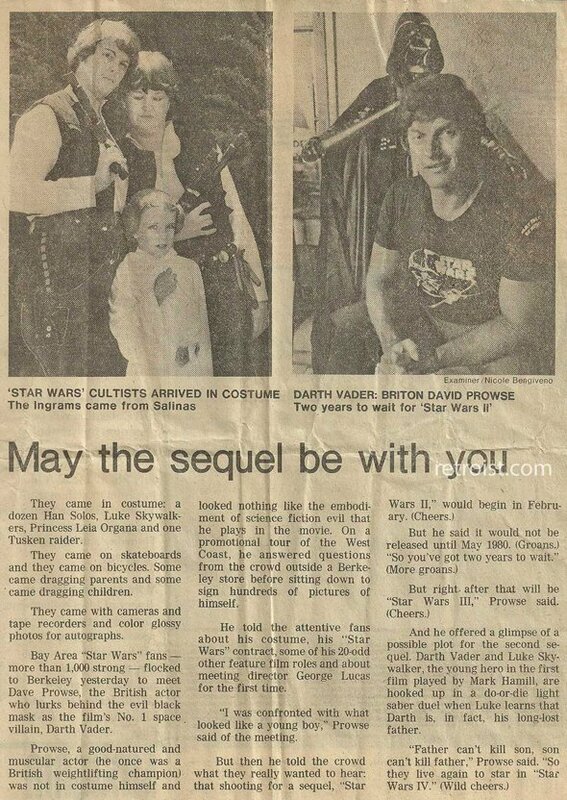 The article was found and cut out by the poster's mother, who knew that her son was a big Star Wars fan, and he has kept the article ever since. What makes the story even more interesting is a piece of lesser-known Star Wars trivia. In their write-up, io9 pointed out that there was very little chance that Prowse really knew what was going on and what the twist would be. According to the site, the original script called for Darth Vader to tell young Luke that Obi-Wan killed his father and considering that James Earl Jones' voice would be dubbed in anyway (and Luke would have the same reaction to both pieces of news, there's no reason why Prowse would have known about the paternity two years before the film came out (Hell, in the article he says that the surprise comes at the end of "Star Wars III." When you consider the fact that the internet has become, ostensibly, spoiler central, it's fun to know that movies were still being ruined more than 30 years ago. You can check out the full article below or see it full-sized over at The Retroist.